Our pallets are manufactured from a softwood sawn carcassing HT ISPM15, Supported with quality ring nails. 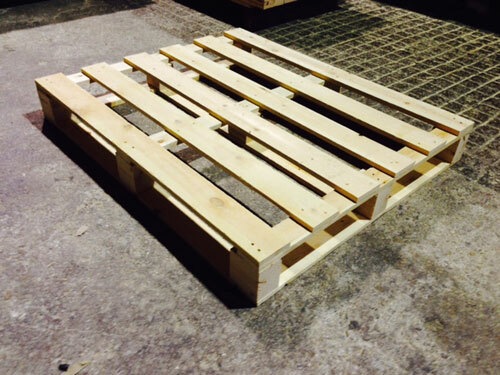 Primarily our business is focused on producing bespoke pallets and cases for our customers’ requirements and we often produce pallets in low quantities in a variety on designs and sizes, pallets can also be 2 way fork lift entry (2WE) or 4 way entry (4WE). We can also supply other pallets such as standard euro pallets in various quantities and reconditioned pallets in other sizes and will also vary dependent on the strength of pallet you require for your load. We can also supply Timber collars for your pallets. We will be more than happy to discuss this product with you or you can email our sales team regarding this product. Please contact us with your specific enquiry or send any relevant information to info@wheelerpackaging.co.uk and we will be happy to see how we can resolve your packaging needs.